Other cultures have recognized the importance of this point. 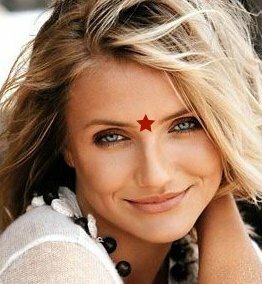 It’s close to (below) the “Third Eye” and the 6th Chakra of Indian traditions. In the short-lived TV show Eli Stone, the title character experienced visions when his acupuncturist needled him on the forehead … a little too high, unfortunately (I’m sure I’m not the only acupuncturist who wrote to them – after a while they obscured the actual insertion location with the actor’s hands). Anyway, I wouldn’t expect to start seeing visions, but it will definitely help you find some inner peace. To use Yin Tang, simply press with a fingertip for about 10 seconds. Take a deep breath, be grateful you’ve backed up your computer, and smile. Don’t you feel better already? 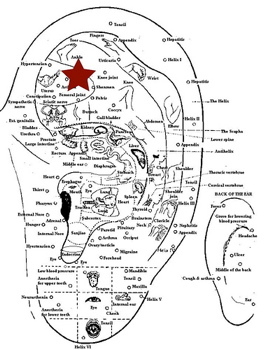 There are about a hundred points on the ear, including this integral part of any stress or mental illness treatment. It reflects the seat of mental health and is terrific for treating any kind of anxiety, depression, grief, or just a rough day. Give your buddy (or yourself!) an ear massage as a sure-fire way to calm things down. This article discusses a study that shows acupuncture is highly effective for depression, and Shenmen is an essential part of that protocol. Shenmen, a lovely way to calm someone down. Try a gentle massage when your driver is experiencing road rage. Press firmly for 10-20 seconds with a healing intention. Nei Guan is one of my favorite acupressure points. It’s perfectly safe (no contraindications), easy to find (2 finger widths from your wrist crease), and easily available, even in public while dressed. It’s wonderful for pretty much ANY stomach complaint. 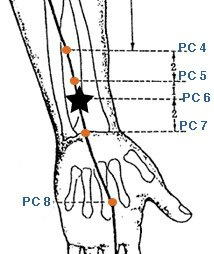 PC-6 is found on the palm side of your forearm, about two inches from the wrist, between the tendons. It’s often used to treat gastritis (stomach pain), seasickness, nausea and reflux, but Nei Guan settles more than just the digestion. It soothes and grounds the spirit, too, with a gentle calming effect. For this reason, it’s perfect to treat an upset stomach due to emotional upheaval. Press firmly (both sides!) for 10-20 seconds with a healing intention. You can also use an acupressure “sea band” bracelet – just position the hard plastic bead on top of PC-6. They can be found at travel stores, some drugstores, and of course I have them at the office. PC-6, excellent for nausea, heartburn, gastritis, or emotional upheaval causing stomach distress. It seems like every January, people ask me about detoxification programs. That makes sense. We live in a pretty dirty world, in terms of chemical pollution. There are hormones and horrifying chemicals in our food. And of course our heads are full of unhealthy thoughts. How do we take an internal shower? Here are some ideas for both physical and emotional detoxing. I was fortunate to have the opportunity to learn detox strategies from David Eisen, the co-founder of the National Acupuncture Detox Association, while volunteering at the Portland Alternative Health Center (now Central City). After addicts got past those worst few hours of stopping drugs, they came to us. I treated people getting clean from crystal meth, heroin, PCP, and alcohol. All of these cases had one set of ear needles in common, the 5 Needle Protocol. 5NP uses points that calm agitation and to speed up the body’s process of filtering out toxins. This same detox protocol, combined with two specific wrist points, are my smoking cessation treatment. By getting the nicotine out of the system more rapidly, it helps reduce the “jitters” and irritability, and decreases cravings. Remember that I am happy to help anyone quit smoking for free – so tell your friends if they’re still hooked. I’m here when they’re ready. Okay – so that’s the physical side. What about mental and emotional toxicity? Negative thought patterns, like prolonged fear and anger, will poison us just as surely as hemlock. Take a minute to ground yourself. Ideally, you should lie down in a quiet place and consciously relax. I love to teach my patients the French Press visualization (now is when you have to pardon me for the “grounds” pun). French Press: Filter out the bad stuff! Imagine you’re that cylinder, with the filter at the top of your head. Slowly move it down, trapping all the bad stuff as it goes. Clear your mind… all the tension & pain is yucky black goo getting swept up by the filter. Above it, you are clear, relaxed, happy. Gradually move that filter down your body, focusing on each level. Neck, shoulders, back… with each inch, more toxins are ensnared. Finally, you will have a clean, healthy body with all the bad stuff stuck at the bottom. 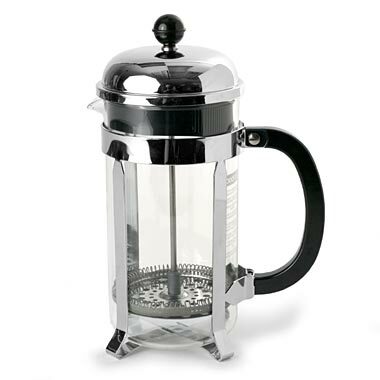 If the French Press doesn’t float your boat, be a tube of toothpaste and squish the goo out. I don’t care what image you use as long as it works for you. Here’s the important bit – push it out of your body through the bottoms of your feet or the tips of your toes (Note: Don’t do this with a pet sitting at your feet – they are sensitive to energy work). Repeat as necessary. You can also imagine yourself floating in a magic stream, with your head upstream. The water is flowing through you, washing away all the pain, tension, disease… all the bad stuff… it just gets swept away by the cleansing water moving through you. The quickie version, at work or when there’s a houseful of screaming kids and bickering relatives: Go to the bathroom, shut the door, and take a deep breath. Sit down for a second and do a mini version of the filter technique. You’ll be amazed at how well it works with just a little practice.